Open a windows explorer and navigate to the folder where you extracted the relevant version of a WolfMame package. Note: If you don't see the Open command window here option on the right click menu, it could be that you didn't hold the 'Shift' key down while right clicking, or you may have a file selected in the right hand pane. If you have a file selected, left click in a blank area of the right hand pane, so that no file is selected, and try this step again. In the resulting window, type the following command where <gamename> is the short name of the game you want to record and <inpname> is the name to use for the inpfile. Please note that you do not include the chevrons, that is the '<' and '>' characters around the <gamename> and <inpname> parameters when you type them, that's just may way of indicating these are parameters to the record batch file. You need to use the Mame short name for the game when recording. For example, to record the game Galaga (Namco rev. B), you need to use galaga for the gamename. The following screen shot shows an example of the command typed in to record this game. For the <inpname> I normally just use the same name as the game name, but prefixed with my initials, so I don't get confused with any other recordings that I may have downloaded to watch. Please note that the part underlined in red on the following screen shot will reflect where you have WolfMame on your machine, I only typed in the part not underlined in red. Press the 'Enter' key on your keyboard, play the game as per usual etc. Once you've completed the recording session, you can then follow the steps below to playback the recording. If you crash and burn on the game, and you want to try recording the same game again, pressing 'Up Arrow' on your keyboard will bring up your last command and then you can press enter to start another recording attempt. Note: These instructions assume that you have the relevant inp file in the folder. eg: If you're playing back a game you just recorded, or you've already unzipped an inp that you downloaded into the correct location. You can skip Step 1 and Step 2 if you already have the command window open from a previous recording or playback session. In the resulting window, type the following command where <gamename> is the short name of the game you want to playback and <inpname> is the name used for the inpfile. Please note that you do not include the chevrons, that is the '<' and '>' characters around the <gamename> and <inpname> parameters when you type them, that's just may way of indicating these are parameters to the playback batch file. You need to use the Mame short name for the game when playing back. For example, to playback the game Galaga (Namco rev. B), you need to use galaga for the <gamename>. The following screen shot shows an example of the command typed in to playback this game. Please note that the part underlined in red will reflect where you have WolfMame on your machine, and I only typed in the part not underlined in red. Press the 'Enter' key on your keyboard and watch the recorded game. If you've recorded and watched your own game, and you want to try recording the same game again, repeatedly pressing 'Up Arrow' and 'Down Arrow' on your keyboard will cycle backwards and forwards through your prior commands. You can use this to easily record, playback, record, playback, ... to keep on improving your score until you finally reach a score for that game that you're happy to submit. After playback is successful, I normally rename the inpfile with the score as part of the name, so that I can keep track of my improvements over time, before starting the next recording attempt. If you don't rename the file, it will get immediately overwritten by the next recording attempt if you use the same name for the <inpname> parameter. This is for 0.171 and later, where I've added a basic record INP button, now that MAME has a fancy new UI with a toolbar for such things. Note that there is no playback INP button yet, this will likely come in the future, as time permits. Also, this feature is still experimental, let me know of any issues (release is expected tomorrow - Feb 24). You can still use record.bat and playback.bat if you wish, this hasn't changed. This is more for the idiots who want to double-click icons. No more INPs just named ".inp". I hope. Step 1: Run MAME. Easy. Just double-click the MAME executable (mamearcade.exe, or mamearcade for Linux or OS X), or call it from a command prompt without any parameters. You'll get the frontend UI with gamelist. Step 2: Single-click the game you wish to play, and then single-click the Record INP button in the toolbar. NVRAM: Checks if -nvram_directory is set to either NUL or /dev/null, and if not, checks if the game-specific NVRAM folder exists. If it does, then the warning is displayed. DIFF: Simply checks if a .dif file for the game exists, displays a warning if it does. Lua: Checks if the Lua console is active (this cannot be disabled before recording starts, as it starts up too early), displaying a warning if it is. Warnings are just that, they won't stop you from starting to record. Step 4: Play the game. Shouldn't be too hard. set /p UserInputPath= What game would you like to play? set /p UserInputPath= What game would you like to playback? Same as with the MENU.bat file, just give the shortcut of the game you want to playback. 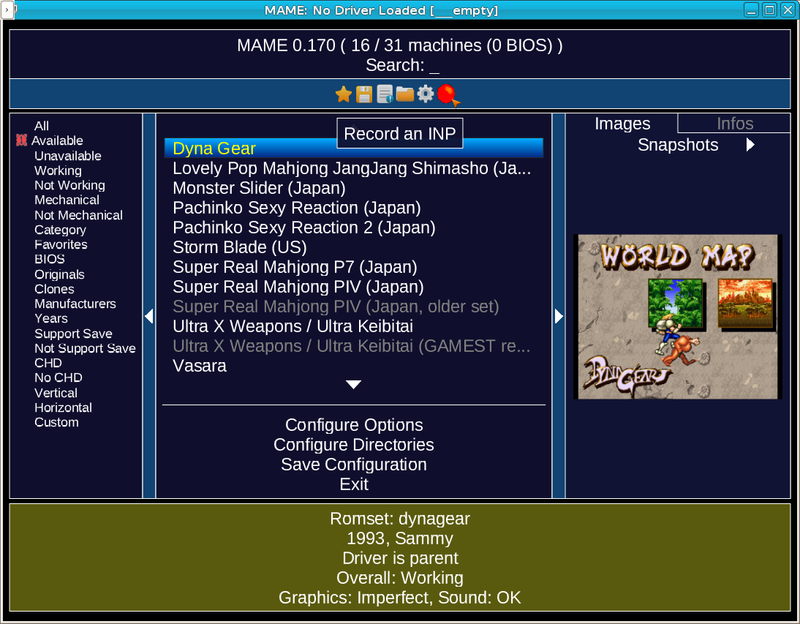 mahlemiut wrote: This is for 0.171 and later, where I've added a basic record INP button, now that MAME has a fancy new UI with a toolbar for such things. A built in UI again in standard Mame. Nice one. Do you think they're likely to put the 'record/playback' functionality into the standard Mame UI in a future release? Since I had to stop it from going back to the menu after running a driver so that it didn't overwrite the INP when running the "empty" driver after recording, probably not in the near future at least. right off the get go I noticed it taxed my old system heavily. I mean wolf170 and mame170 are playing 100% - 112% if I hit F10. the new wolf171 throws my gameplay clear back to only 60% - 80% with frameskip 10 and F10!! in other words can"t pull it no-way no-how unplayable. What video renderer are you using (D3D, OpenGL, GDI, BGFX)? I've not noticed any major slowdown myself, and I'm sure I have older hardware than you both. One useful note, the BGFX renderer will do rendering in a separate thread, like what -mt does, but does it properly, so -video bgfx might be faster for many of you. Ok, I've tested a few drivers. This slowdown does not seem to affect every driver. I can confirm that the X68000 driver is almost 50% slower, and the PCE driver (tested tvdormon) is about 25% slower. However, looking at the SSV drivers, there was minimal slowdown, and the ZN (PSX-based) driver, there was no difference at all. Will pass this on though, see if we can at least figure out the cause. Thanks for the info. The performance of X68K or PCE drivers is an important factor for me. I will continue with WOLFMAME and GROOVYMAME 0.170 because I can live without the new UI after all..
OutRunner wrote: Thanks for the info. The performance of X68K or PCE drivers is an important factor for me. 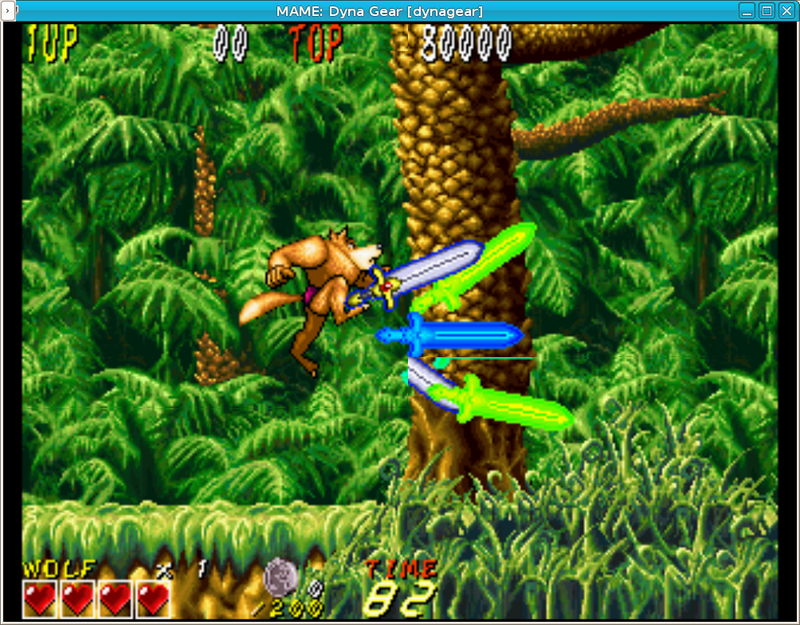 I will continue with WOLFMAME and GROOVYMAME 0.170 because I can live without the new UI after all..
Don't worry, I care about the x68k driver also, am looking into this.